Today (29 October) French fashion conglomerate Kering and the London College of Fashion teamed up to launch a new sustainable fashion conference, an award for sustainable fashion and a sustainable design course. And earlier this month, the Waste and Resources Action Programme (WRAP) challenged fashion students and industry professionals to come up with new clothes which remained 'in vogue' and wearable for longer. Is it really possible to overcome the fast-fashion phenomenon? And is that already happening? With 85% of discarded clothes currently ending up at landfill, the aforementioned initiatives are much-needed to tackle part of the sustainability black hole which is the fashion industry. The issue is beginning to creep up the agenda for fashion firms large and small, as sustainable design continues to grow in importance. To explore the current state-of-play further, edie has rounded up five firms who are tackling fashion profligacy head-on with innovative solutions to long-standing problems. The problem: It can take more than 20,000 litres of water to produce 1kg of cotton; equivalent to a single T-shirt and pair of jeans. Growing the water-intensive crop is already having a tangible effect on the planet. 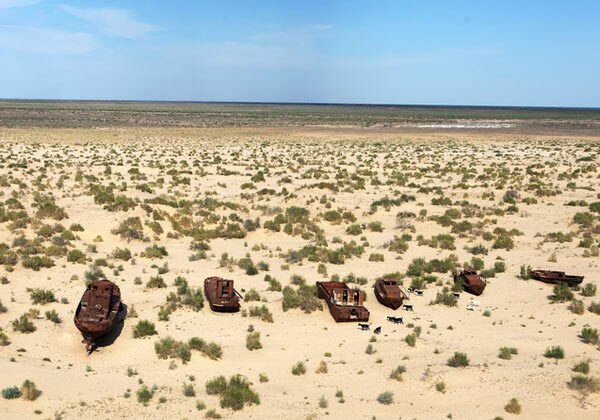 It is blamed for the rapidly diminishing Aral Sea, once the world's fourth largest lake, but now dried up to almost nothing. The solution: Research from Levi's found that water was used in three separate stages of their jeans lifecycle; 49% was used during the cotton-growing stage, 46% when customers washed their jeans and 6% during the manufacturing process. Its new range of WaterLess jeans addressed all of these phases and cuts water-use by an average of 28%. For the start of the production cycle, Levi's partnered with the Better Cotton Initiative to reduce water and chemicals used in the growing process. In the second phase, dry stones were used instead of wet ones to create certain finishes and the number of wash cycles that jeans went through was reduced by combining multiple wet-process cycles into a single one. Finally, Levi's is educating customers about the part they can play in reducing the impact of their jeans, launching a global initiative including new care tags encouraging consumers to wash their jeans less, and to wash in cold water and line dry. At the product launch, the Levis CEO Charles V. Bergh boasted that he hadn't washed his jeans in over a year. Where possible, some companies have moved away from natural crops altogether, with The North Face pledging to use 100% recycled polyester fabric by 2016 - material that will be mainly sourced from post-consumer water bottles. The problem: An average of 10-15% of the fabric used to make every garment is thrown away, a sobering statistic given the millions of garments produced every year. The solution: New Yorker Daniel Silverstein attempted to tackle this problem by incorporating these 'scraps' into the design of his clothes. Using a unique draping technique, Silverstein keeps fabric waste close to zero. 'Spine' details and special embellishments wrap around the body to use the full yardage of fabric put into each piece. In Silverstein's own word: "I just left a meeting where I wanted to have garments cut out, and the factory owner could not understand why I would save my fabric scraps. She also did not understand they were artfully laid out to be appliquéd on to the dresses after the pieces had been cut. She told me she pays more than $500 per month to have her scraps removed, and thrown into landfills because her business is so wasteful." Even scraps of clothing that cannot be designed onto clothes can be reused. They are recycled into raw materials for use in products like insulation, carpet padding and stuffing for toys. The problem: Oxfam has said that 9,513 garments are thrown into landfill every five minutes, totalling one billion items per year and the equivalent of one in four garments sold. The solution: Stella McCartney has tackled this problem by making her clothes more biodegradable. Well-known as an animal lover, she refuses to use any skins furs or leathers in her designs. That means she is forced to experiment with a variety of synthetic fabrics and materials, which led her to the biodegradable thermoplastic Apinat, which now makes up the sole of all of Stella shoes. In fact the range was so successful that parent company Kering introduced biodegradable soles across several other brands, including Gucci and Puma. The problem: The chemical compound used to make polyester fabric is identical to the compound used to make plastic water bottles - polyethylene terephthalate. This means that it takes polyester almost as long to decompose as it takes a plastic bottle - up to 450 years. The solution: Icebreaker Merino are a New Zealand company who are philosophically opposed to Stella, in theory at least. Forgoing the laboratory they have used nature's own design to create a renewable, recyclable and biodegradable fleece from the wool of New Zealand's merino sheep. The company demonstrates the biodegradability in a video by burying it for six months. Isle of Wight-based fashion house Rapanui has even gone a step further to tackle the root of the problem, by offering store credit to customers who return last-season's clothes. All returned clothes are recycled properly, in-line with the Rapanui ethos, where they make t-shirts, tops and sweats from 100% certified organic cotton in a wind-powered factory. Read more of edie's sustainable fashion news here.